Well, it's a big week here in the U.S. of A., in which we all gear up for the national holiday that is Super Bowl Sunday. Naturally, that means I'm thinking a lot about American football gaming. It makes sense to build such a game based on players' skills. Interestingly, this is one of the most open-ended ideas in the realm of OSR games, so there are a lot of options. Some folks like the idea of modeling skills after saving throws. Some use a d20 roll-under method like that in the popular Rules Cyclopedia. Many, however, are willing to stick with the tried-and-true d6 for resolving questions of skill. Now, how do we use these numbers? An easy way would be to generate player-vs-player matchups and resolve them with a couple of rolls. 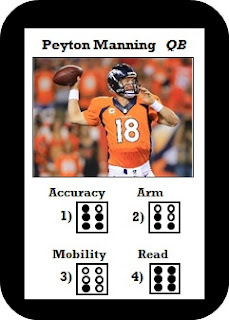 Stealing a page from the football card game Third and Long, we can reduce an offensive drive to a few "key plays" and identify the players critical to each (getting as specific as the exact skill(s) required by each player). 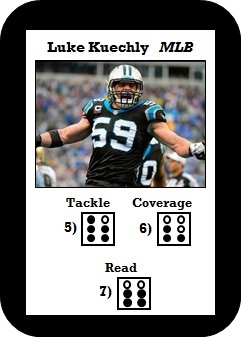 Manning succeeds, Kuechly fails...move two spaces. Both succeed...one space. Both fail...retry. Offensive failure + defensive success...it's fourth down and time to make a choice. Or something like that. 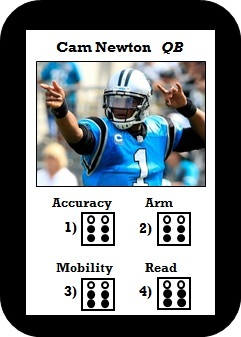 (Or, just use opposed rolls...) Then, add in field goals and punts and whatnot. This is all pretty much thinking out loud at the moment. I'm having fun with it and am really open to any suggestions others might have for such a minigame! Enjoy the game on Sunday, football fans!